As we mentioned the other day in our MR PORTER post, we're excited that there is an online shop accessible to the USA that carries Mr. Bathing Ape's range of luxury menswear. Though their suits are very traditional in their fabrics and designs, Bape's true colors still come through in their neckties. Like their camouflage sweatshirts, the neckties come in a variety of colors like this regular military colorway or their tonal black 'hidden camo' which happens to be my favorite. 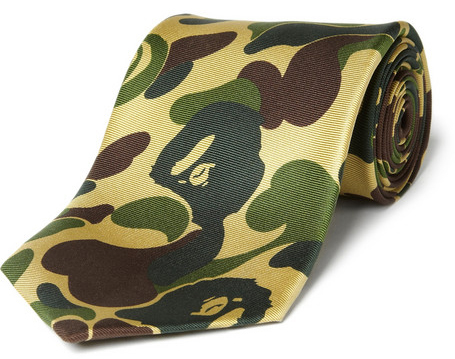 All of them are available at MR PORTER now, but additional colors of neckties do occasionally release through the Bape line at Bape Stores worldwide.